It might surprise you, but the ability of the chameleon to change colors rapidly – a trait that has given this lizard family the reputation of master of disguise – has only been discovered recently. They adjust a layer of specialized cells hidden under their skin, according to a new study. This famous trait of changing color to blend in with its surroundings – the reason perhaps that the word ‘chameleon’ means ‘lion of the ground’ – is hardly unique to reptiles. Although a number of squids and octopus are able to change color and even their shape at will, they do it by building up and releasing pigments inside their skin – materials whose colors are dependent on the wavelengths of light they absorb and reflect back. Chameleons, however, are dependent on structural changes impacting how the light reflects from their skin. To investigate exactly how this happens, the researchers studied five individual adult males, four adult females and an additional group of four juvenile panther chameleons (Furcifer pardalis), an Old World lizard living in Madagascar. What the scientists discovered is that each of the chameleons in the study contained two thick, superposed layers of what are called iridophore cells — iridescent cells containing a series of pigments, as well as chambers that control how light is reflected off them. Within these iridophore cells are nanocrystals of varying sizes, shapes and orientation, all of which must act together when the chameleon’s colors shift, according to the researchers, who published their work Tuesday in Nature Communications. The chameleons themselves alter the structural arrangements of the iridophores by simply relaxing or exciting the scales on their skin, and bringing about a change in the color. 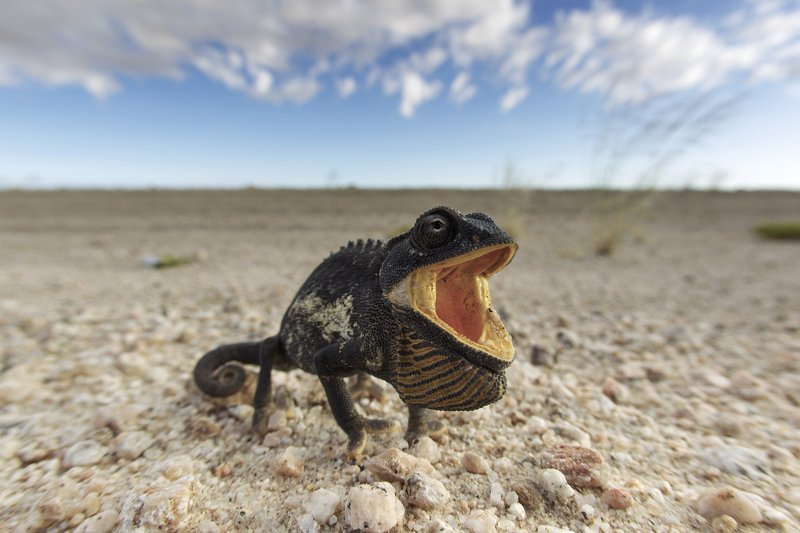 While most species appear characteristically green, aggressive chameleons can sometimes turn black. Much of these color shifts are associated with moods. A male chameleon may remain in a content state lying on a branch shortly after eating, and then change color when it sees a potential rival in its territory, changing color at once. Changes in temperature can also cause their skin to change color. “When the skin is in the relaxed state, the nanocrystals in the iridophore cells are very close to each other — hence, the cells specifically reflect short wavelengths, such as blue,” said the paper’s senior author Michel Milinkovitch, who is a professor of genetics and evolutionary biology at the University of Geneva in Switzerland. By comparison, any stimulation of the skin stretches the distance between each of these nanocrystals. When this happens, every iridophore cell that hosts these nanocrystals, begins to selectively reflect colors that contain longer wavelengths, particularly yellow, orange and red, explained Milinkovitch in an email to LiveScience. While chameleons are naturally blue, a color that often appears in domestic captivity, due to the nature of terrarium lighting, their skin contains pigments of yellow allowing them to produce the characteristic green color we often associate with reptiles, one that allows them to camouflage safely among trees and plants to easily stalk prey and evade predators. “The red skin hue does not change dramatically during excitation, but its brightness increases,” wrote the researchers in their paper. Furthermore, the researchers found a deeper and thicker layer of skin cells that reflect a large amount of near-infrared sunlight. While these cells do not appear to change color, it’s possible that they help the chameleons reflect heat and stay cool, the researchers said. In order to study the way in which the iridophore cells behave, the researchers employed several methods. Using high definition video with a macro lens, they were able to record the chameleons’ color changes, enough to make numerical models demonstrating the ways in which their nanocrystals reflect any light. As many species bear stripes on their skins, often the stripes would become more pronounced when the lizards were provoked. “The results are a perfect match with what we observe [in real life],” said Milinkovitch of the videos. To manipulate the cells directly, the researchers used water solutions both hyper-and hypotonic, which led to their skin cells either swelling or shrinking, altering the visible colors produced by the distance between nanocrystals, fulfilling the researchers’ initial predictions. However, more research remains, in finding out the impact sexual selection may have on color changes, as this trademark behavior only occurs in adult male chameleons, and is often associated with either attracting a female or warding off a potential male rival. Both females as well as juvenile chameleons typically have dull coloration and also a significantly reduced upper layer of iridophore cells, said Milinkovitch. These discoveries could have some real benefits for both engineers and physicists who attempt to duplicate the chameleon’s color-changing methods for new technology. Particularly, the nature of iridophores could be beneficial for developing appliances, such as television sets which don’t attract a glare from window panes.